The collaborative robotic assistant cora supports humans in all standard tasks of automated tool delivery. Easy access The small distance between the high-precision spindle and roboSet ensures optimum working conditions. 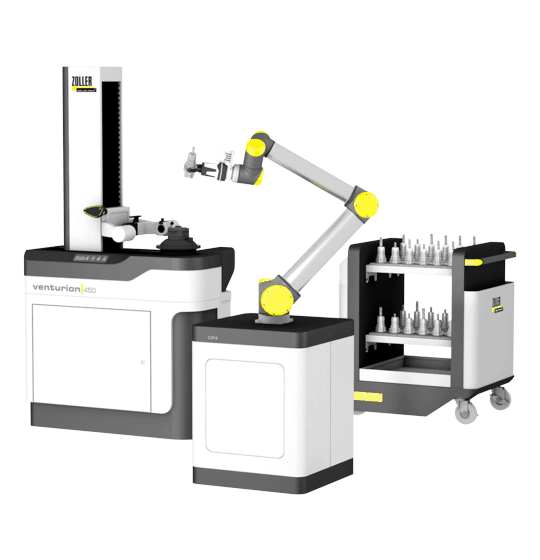 CNC robot loading arm Featuring a specially configured additional handle which can securely grip and operate the pull-outs on ZOLLER Smart Cabinets. After opening or closing, it is swivelled by 90° and does not interfere with tool handling. Gripper Can securely grip a wide range of complete tools and a variety of tool holders, positioning them in either the presetting and measuring machine, Smart Cabinet or tool trolley. High-precision spindle With the ZOLLER ace spindle the tool post for steep tapers, hollow shaft tapers, Capto and Kennametal can be changed via one ball bushing, absolutely free of play and with guaranteed changeover precision of 0.001mm. Membrane keypad All of the power-operated functions of the high-precision spindle are started by a light keystroke, which is simple, convenient and guarantees consistent accuracy. Tool trolley A machine shop necessity that makes storage and transportation of tools fast, simple and hassle-free. The cora collaborative robotic assistant supports humans in all standard tasks in automated tool preparation – your tools can be picked, assembled, clamped, cleaned and labelled for you. The gripper can securely grasp a wide range of complete tools and tool holders, positioning them in the presetting and measuring machine, Smart Cabinets or tool trolley. Thanks to its connection to the central tool database z.One, and thus to ZOLLER tool management solutions software, cora knows where each tool and component is located. It can move prepared tools straight into the presetting and measuring machine and begin the measurement process.